Goats do the weirdest things! All I want for Christmas is a goat! What’s better than baby goats? Baby goats in pajamas! According to centuries of Chinese culture and ancient history, we are about to enter The Year of the Goat, one of 12 cycle years in the calendar. We are excited to use this as a playful and creative way to engage the community with our goats and celebrate our heritage of 90 years of business in Waunakee. GOATS! It’s okay to be smart. 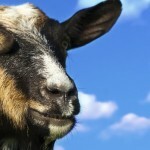 Goats are far more clever than previously thought, and have an excellent memory. The Internet’s Great Goat Obsession. Copyright © 2019 Endres Manufacturing. Powered by WordPress. Theme: Spacious by ThemeGrill.